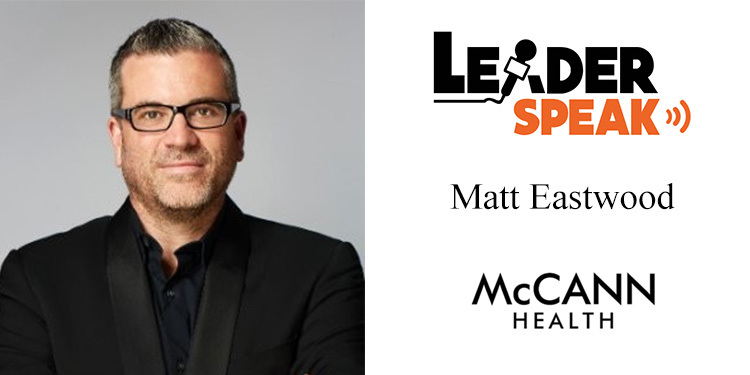 Leaderspeak with Matt Eastwood,Global Chief Creative Officer, McCan Health. Leaderspeak with Matt Eastwood, Global Chief Creative Officer, McCan Health. Matt Eastwood is the Global Chief Creative Officer at McCan Health. He has led some of the world’s most renowned advertising agencies such as JWT, DDB New York etc. While the audience at Goa fest 2019 received an informative session by Matt Eastwood, I had an insightful conversation with him about the current advertising space, his decision to move from JWT Global Creative role to head a Health unit at McCan Global, and a lot more. What brought you to McCann Health? Why did you want to take on a creative role for a specific unit while in JWT you were the global chief creative officer? Leading a unit is very interesting. The health industry had started to really interest me over the last 4-5 years, and I think some of the favourite work that I did, while I was at JWT, was in the health space with companies like Johnson and Johnson etc. And so it started to sort of strike me that there a lot of undiscovered creative opportunities in the health space. It was interesting when the CEO of McCann health approach me and said, ‘’Would you be interested in taking on this role?’’ I certainly hadn’t sat there thinking about it, “I’d love to run a health network.” But for me, that seemed like a really natural step into the direction that the industry was heading. So yeah, I’m excited to do something a bit more challenging and challenging myself, and learn about this new industry, and hopefully do some, groundbreaking creative work along the way. What’s your understanding of the Indian market, which include brands, creators and the audience? What’s your vision for McCan in the Indian market? One of the reasons why I was really excited to come to India was because of the great work which McCann Health in India has done. And I applaud them hugely, though, the work that the Indian office did for the immunity charm, which won the Grand Prix at Canne a couple of years ago. I think that is a great example to the industry, to creative people, and also the clients of what creativity can do on behalf of your brand. So I’m really excited to exploit that more, and to look for more and more examples of how creativity can give you an unfair advantage as a former client or a health client. What different have you been trying to do or get into the systems of McCann? The interesting thing is, that, it’s a blessing and a curse, because I come into this industry quite naïve. I certainly didn’t know, the health industry inside out, and that a lot of people have been working in it for it’s all day of their lives. I think, in a way, that is the strength that I bring, because I’m asking questions that, that perhaps are based on our assumptions. I don’t know the rules and I don’t know the conventions, I’m sort of looking at different ways to deliver creativity and business solutions on behalf of our clients. I’ve found that clients are responding really well to this way because, in my career, I’ve done lots of great things for general brands. And they’re excited to see how I can take that kind of thinking on behalf of their brand. So that’s the big thing that I’m trying to sort of deliver throughout the whole company is to simply Do not rest on the cliches and conventions, look outside of that and challenge yourself to look at a project in a different way than the way it’s always been done. What according to you has changed in the past decade across entire advertising field? 10 years ago it sort of became a little trendy to do purpose driven advertising, which was a good thing for the planet and for humanity, but I think what has changed now is when you consider that the biggest buying group on the planet is millennials; they want things their way, which is great, because they’re saying, if you are polluting the planet, if you’re doing bad things to the planet, then you are bad. They are clear with what they want. I love that change; that now, brands and clients, almost alike take the responsibility that governments used to take and really can make a difference, which I think, is fantastic. Particularly in the United States at the moment, you see, brands like Nike are taking a stand that the government won’t take, which is amazing. And I think that was a great vindication for brands going, you know, what this is what’s important to us. In the health industry, I think it’s just interesting, because just this week, you know, Amazon announced that Alexa was now approved by the FDA for exchanging information back and forth between a doctor and a patient. It’s a great shift in the way we communicate with customers. I think technology and sort of that idea of purposes now embedded are two of the biggest changes. Is the attention span of audiences actually reducing or its just that the audience knows what they want to watch. All people want to do with most YouTube ads is to skip, or wait for it to get over but when the content is great the audience doesn’t mind watching longer versions of the same. Look at Game Of Thrones for example, each episode is the final season is as good as a feature film. So is it the quality of content or just that the audience knows what they truly want? I think it’s interesting, because, you know, you look at any research around millennials in particular. And I actually think it’s true that most people advertising. They hate being sold to and they, don’t like being sold to in a traditional way and don’t like advertisers trying to get their money, etc. But what they love is a brand experience, and they love it when a brand brings them something that’s useful to them, or is life changing. So it’s not that they hate advertisers, but they hate traditional advertising, and they’re bored with it; they don’t want to watch 30 seconds a car advertisement saying come down for a test drive, which doesn’t resonate with them. But for me, I think what they’ve said is we will give you all the attention you need, if you give us the content that we want, which is great. And that pushes the whole industry forward. How do you manage multiple operations in at McCann Health since you’re the Global Creative. Don’t you feel 24 hours in a day are less for you? I don’t sleep. You know, it’s funny, the challenge of a global role is that there is always a country waking up who wants to have a conversation with me. So you know, it goes, non-stop. But, you know, for me, I’m really big on, connecting with the people I’m working with, and part of the reason I’m here in India is, I spent the last two days with the agency in Mumbai, and talked to them about the vision etc. I’m doing that in most of the big offices around the world. I think it’s about constant communication, you just got to make sure that people know, the ambition of the company, they know what I’m trying to achieve, and just keep reminding people over and over again. I love this industry because of the people so, it never feels overwhelming for me. And, you know, I don’t mind if I’m on the phone at nine o’clock at night to China or whatever, that’s the job, you know. And, I get to come to amazing places. And talking about people, when you hire new people what sort values do you look for? I’ve been very deliberate about the kind of people that I hire. And over the years, I’ve kind of narrowed it down to two things that I look for. Actually, I have a poster on the wall in my office, which says, work hard and be nice to people. And I think that’s really important. I want to work with people who are good people, I don’t want to work with people who yell at other people or belittle other people or, you know, make people feel small. That’s just me. I think work is more fun when you work with good people. I always look for passion over talent, I think, you have to have a certain degree of talent. I mean, otherwise, we won’t be having a conversation. But there’s not as many people who have this slight ambition and this passion to really succeed. So I look more now for people who demonstrate passion, who really believe that, in what they’re doing, and they go above and beyond in everything they do so. I think somebody who is passionate about one thing is generally passionate about every everything. So I think if you can identify people that have talent, but have great passion, then you’ll be successful.